Off to Germany again for more ‘clearance work’! With most of the ‘not done yet’ lines in the south it was time to start clearing the south of Baden-Württemberg and a variety of cross border lines into France, Switzerland and Austria. BA’s staff were threatening to strike so I had a contingency plan involving Eurostar, but fortunately it all calmed down and I didn’t need to use it. A good day for the British rail system, for once - and the quiz season hasn’t started yet. 0614 Telford - BNS arrived early and greatly amused me with a recorded safety announcement. No mention of lifejackets fortunately. On time at BNS where 0703 Piccadilly-Bomo Voyager also arrived early. On time again at Cov., just got round to the Tech in time for an early running 19W which got me to work well before 8 (scheduled 0805, I believe). In the evening 1635 19W took me into town. I saw the 1704 local go, but caught 1727 Pendo (also on time) to Birmingham Irrational. Terrible rough ride and an alarming jolt just west of Beechwood Tunnel. After all the alarms and excursions (strike threat/called off, cancellations, short staff etc) BA’s RJ100 got me to STR just 5 late at 2210, and I reached the station in plenty of time for 2238 S-Bahn. Fair enough - 2208 wasn’t ever going to be a runner. What a brilliant idea to have VVS ticket machines in the baggage hall, though STR was its usual exemplary self and my baggage arrived at the conveyor less than a minute after me. S-Bahn into S-Hbf, and the Hotel Mack was located without problem. Apart from the mosaic tiles (various shades of brown) in the bathroom the Hotel Mack was fine and after a standard (i.e. good) breakfast I tottered across to the station and caught 0917 to Rottweil via Böblingen, to discover too late that I still need Tübingen-Horb! Still, I’ve got to go back to Tübingen to do the other route to Sigmaringen, not to mention the branch connection at Metzingen, so ‘tis no great drama. Arriving at Rottweil we used the comparatively rare P3 which seems to host only terminating/originating Stuttgart trains, so I caught 1112 RE back to Oberndorf to pick up my original schedule there. Sad really, but better than watching it rain for an hour. The station buff was open but a) 1047 is too early, b) it only had two customers, of the sort you might expect, and c) it looked dreary. 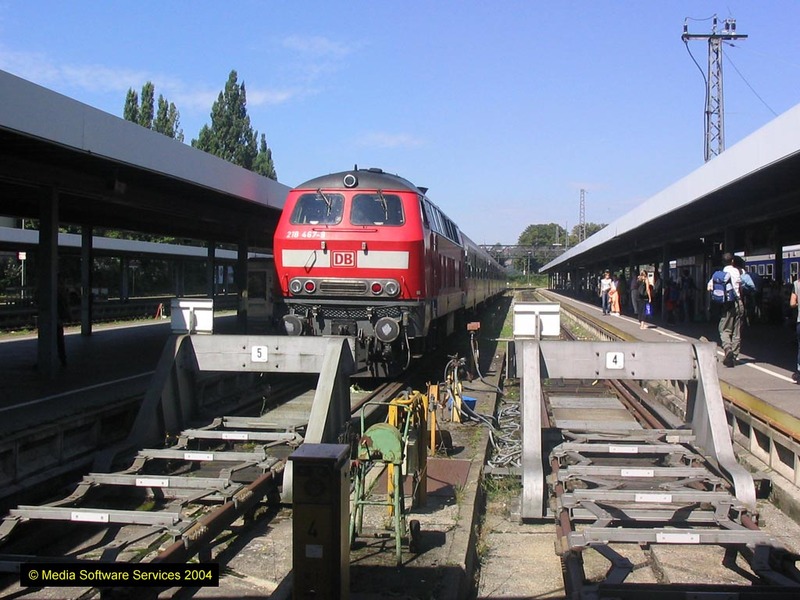 Photted an Italian ETR470 set on a Cisalpino to Milano at Rottweil - smart but with a rather agricultural ‘roof rack’ arrangement presumably to screen braking resistors or something of the sort. Oberndorf is blessed with a waiting room and very smart loos (unlike the wretched electric kart which didn’t have any, smart or otherwise), so the short trip was no hardship. The 1137 to Singen was a proper train with 110 274 hauling. This rather obligingly did the other half of the split alignment at Talhausen which was Another Good Thing. Onwards to Singen where there was a lot of rain and no beer! Here it became apparent that Max Maulwurf was trying to cause trouble over the weekend between Singen and Engen - but much worse, that the withdrawal of the tilting class 611s with axle problems was causing temporary timetables and all sorts of mayhem which will affect The Plan. Clearly more research is needed. Meanwhile, off to Donaueschingen via Immendingen, where it seems highly likely that terminating services from Tuttlingen don’t do the physical connection. 611s permitting I’ll be on a through service on Monday! Having purchased a timetable (luckily) at Stuttgart I’d noticed that HzL trains were running through to a short ex-goods branch to Bräunlingen. Fortunately there was an hour’s slack in the plan later in the day, and a train which suited (1353 out and 1406 back) so I took the HzL Trapeziwagen down the branch. It used to end in a factory beyond a level crossing but there is now a buffer stop before the crossing, at the end of a very short platform. A runround loop is provided just east of the platform though what might use it isn’t clear. Engineers trains maybe. There is one intermediate stop at Bräunlingen Industriegebiet, which was omitted on my journeys. Only three passengers went out, with about half a dozen waiting at Bräunlingen for the return. A kindly Greater Authority had provided a station buff at Donaueschingen, together with enough time to patronise it. A half litre of Fürstenberg wasn’t exciting by any means, but did restore morale (I’d spotted another SEV notice on my travels, this time for buses east of Tuttlingen. There seems no hope!). Any port in a storm I guess, besides it is the local brew in Donaueschingen. 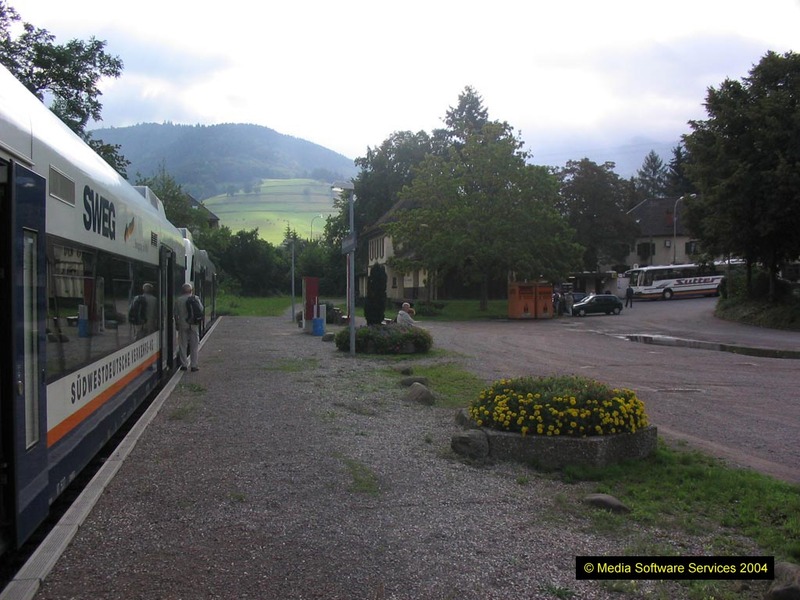 On in a 628 to Neustadt (Schwarzwald) during which I was able to catch a few Zs. A double deck electric-hauled set was waiting to go on to Freiburg, and I went with it as far as Titisee. 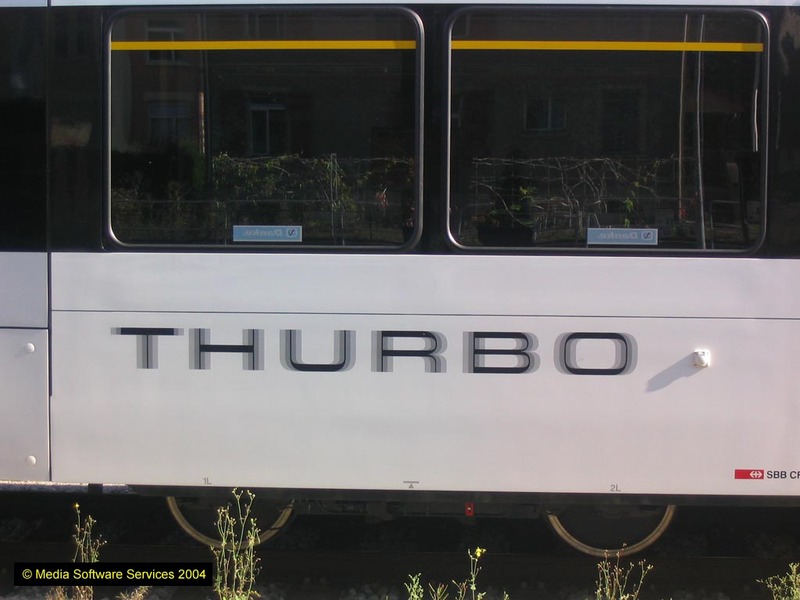 Here virtually all trains use P3 including mine which was a 3-car double decker, loco hauled again, to Seebrugg. 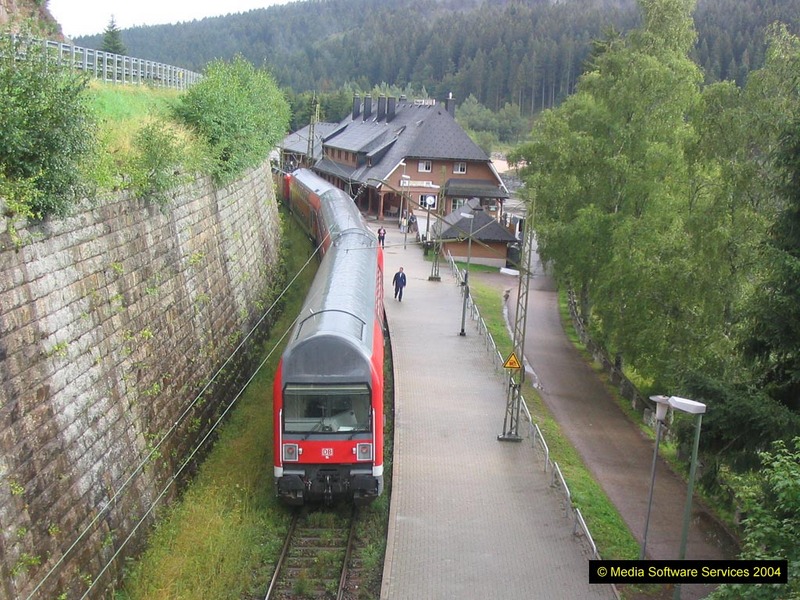 This must be a seriously scenic line on a nice day, all trees and hills and two large lakes, Schluchsee and Titisee. Unfortunately it wasn’t a nice day… A particularly vertiginous footbridge provided an interesting shot at Seebrugg, where there are stabling sidings beyond the platform. The station buff sold Rothaus Bräu and should have been sampled, but wasn’t! With dead track for another 71 mins to Freiburg, another few Zs might have come in useful. There followed a rather dreary run with low cloud, occasional heavy rain and general gloom. On my previous trip over the Hinterzarten - Himmelreich section I’d somehow managed not to notice the extremely steep gradient (around 1 in 20). It’s hardly surprising given Hinterzarten at 885 metres, not far shy of 3000’, and Himmelreich at 455 (1500’ or so). By Wielve on the outskirts of Freiburg it’s down to 280, and a bit less in Freiburg. By Freiburg the sun was out and blue sky prevailed, briefly. The run out to Breisach was a 2-car Trapeziowagen, well wedged when it left Freiburg (well, it was 1807) and emptying out as it went, particularly at Gottenheim. At least half did the distance though. 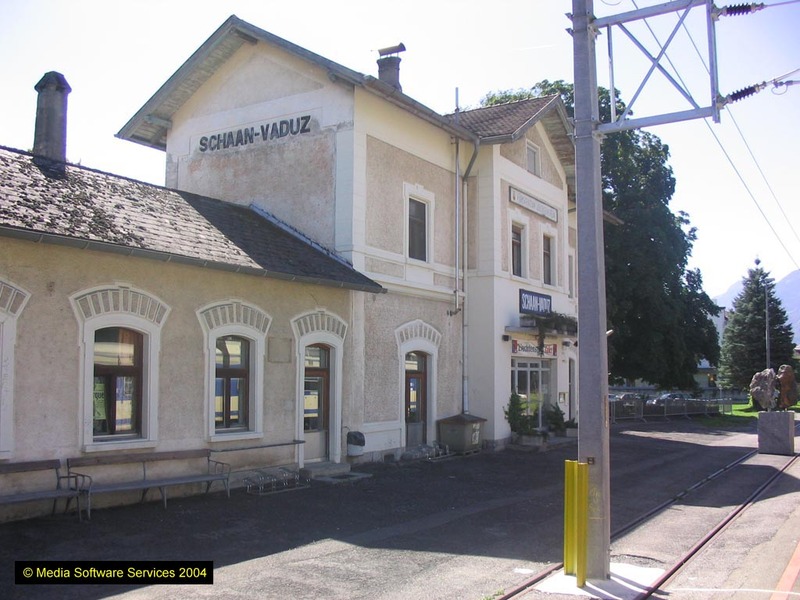 The physical connection at Breisach is well before the station; there’s a single line in so no problems there. 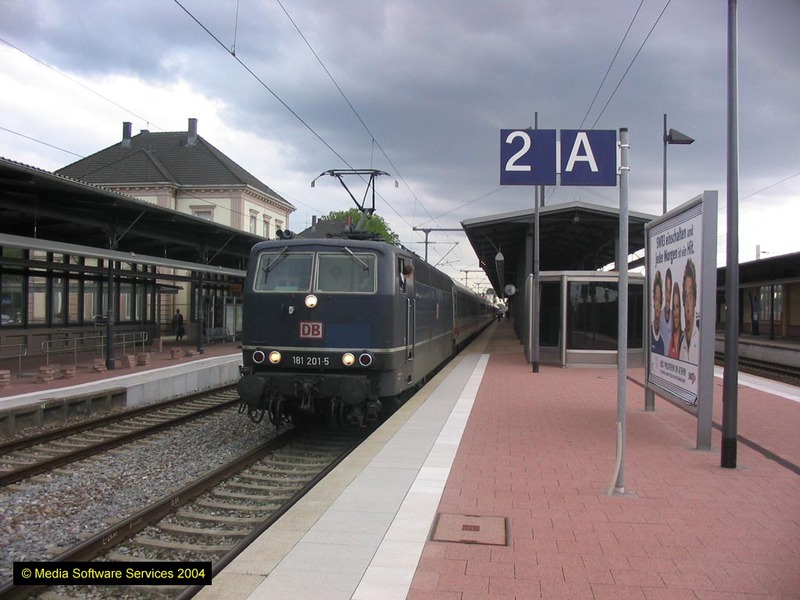 After some confusion on my part at Breisach, we left from the same platform, in a different unit but with at least one (I can’t see from here) of the units which had come from Freiburg attached at the rear. All will be revealed at Riegel perhaps. 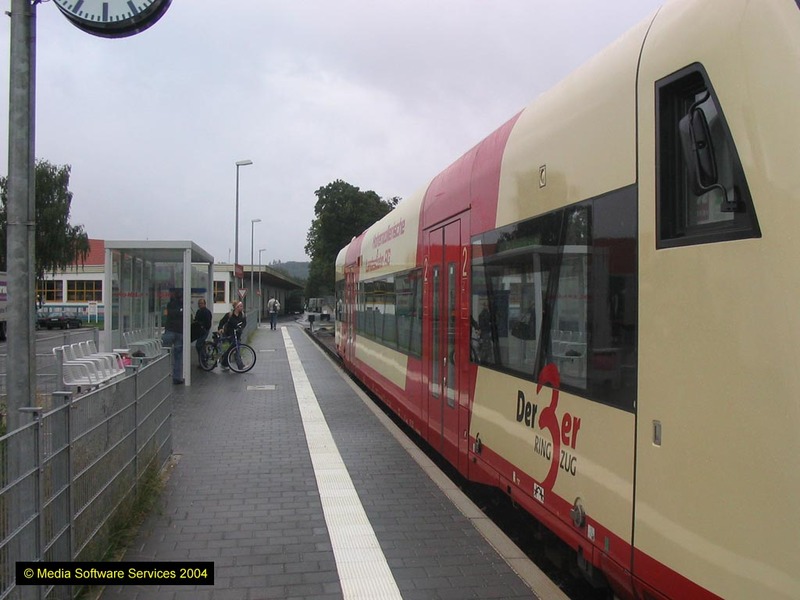 It was in fact revealed at Endingen where the two units were dropped off at the large SWEG depot, the necessary run out of the station to clear the points, and reverse back to the platform, being done with passengers in situ. To my relief the single kart continued to Riegel as booked - despite the destination ‘Riegel DB’ it didn’t do the connection (looks as if there’s one both ways) but terminated in the Kaiserstuhlbahn platform. The RE back to Freiburg was 6 late but hey, not a bad day with an extra branch done and everything else as planned. Central Hotel was located OK - verges on smart (as it might at €59, rack rate 79), though claiming only to be an hotel garni. Set off again about 2030 with a view to ticking the three brewpubs. Found the Kleines Freiburger Brauhaus in the end after some alarm when O’Kelly’s Irish Pub was where the map said the KFB was. It’s in the street behind. A bit bleak inside - beer (Helles, 0.4l @ €2.50, didn’t try the Dunkles) was OKish. Seemingly unfiltered and certainly better than the canned Fürstenberg procured en route to Breisach which was grim. Not star quality though. Martin’s Bräu was a different kessel of fisch altogether - a beerhall/factory operation reminiscent of Schumacher’s (Oststrasse) in Düsseldorf but more cheerful. Utterly admirable - friendly service, food promptly served (a very enjoyable schnitzel and sautées) and a hefeweizen to die for, bottled or not. OK then, I liked the place. Last port of call was Feierling - a modern approach. Unfiltered pils not particularly to my taste (or pocket) so despite the delightful barmaid, Martin’s Bräu gets the vote with ease! Arrival back at 2345, probably losing the Sensible Prize thereby. HzL single unit at Bräunlingen 26.8.04. The line used to continue across the road to the factory you can see beyond the kart. 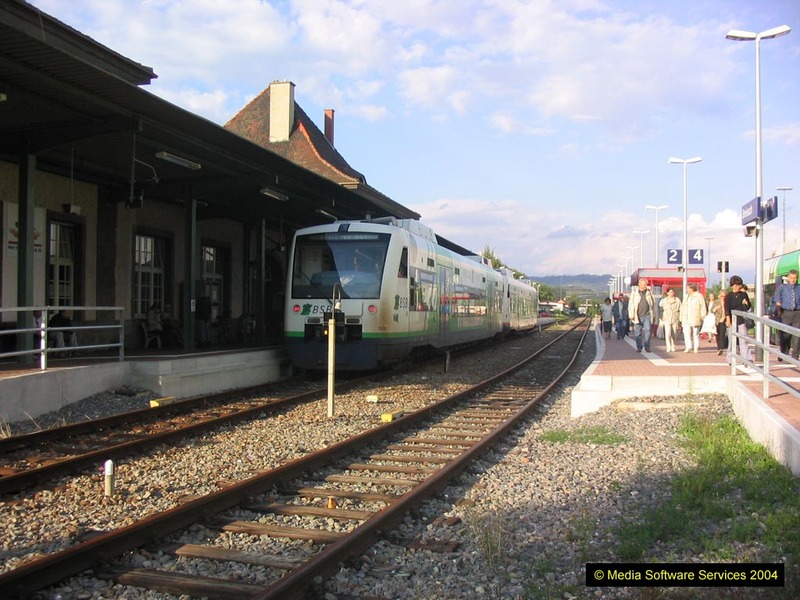 The terminus at Breisach 26.8.04, with SWEG units. I'm facing east (towards Freiburg and Riegel) here - the line used to continue behind me across the Rhine into France. Definitely lost the Sensible Prize - 0720 was too early! Arrived downstairs just before 8 to find the lobby piled high with luggage - fortunately its owners had (mostly) just departed from the breakfast room. The staff, to their credit, were working very hard to clear up and had maintained full supplies of everything except fresh fruit. All in all quite a good place to stay. Back at the station Herr Helpful of DB was very obliging with pages of emergency timetable for Singen - Lindau. I then conceived the idea of going to Stockach first then Lindau as it doesn’t matter if I come back from Lindau in the dark. Looks as if it will work, just. And so by the 0923 to Münstertal, an SWEG kart which works through on to the branch at Bad Krozingen. This is done by crossing over before the goods loops north of BK, then working south over the northbound loop and into the bay. Quite a worthwhile exercise if you’re sad enough to care about these things. The branch is a pleasant one - sort of ‘prosperous rural’ presumably providing nice ‘fringe of the Black Forest’ places for upwardly mobile Freiburgers to live. Traces of the Sulzburg branch are visible at Staufen, itself a pleasant small town. For want of anything better to do I went back to Freiburg (had to go one station anyway, to do the track) on a very wedged double decker, before heading south again to Basel Badischer Bahnhof on another one, less wedged fortunately as it was an hour’s ride. It stopped at all stations (i.e. every 3-4 minutes on average) so quite why it rates as RE I don’t know. A fairly dull ride until quite near Weil am Rhein, then the valley closes in slightly and the line is at a slightly higher level with three tunnels. Very extensive yards on the west side of the line before, during and after Weil am Rhein. Basel Bad is a totally German (and rather unprepossessing) station, with Swiss border controls at the exit. I didn’t go outside on this occasion but returned to Weil am Rhein on the next Freiburg train. The Rhein valley trains all use P7/8 at Weil (or might be 8/9!) and Lörrach trains are all off P1, however in theory you could go from P1 to Basel so honour is just about satisfied. 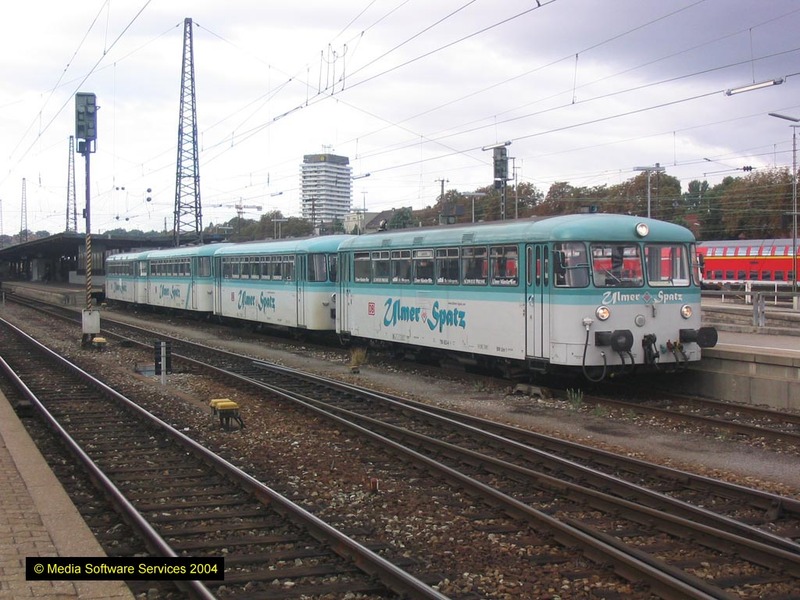 I was surprised when an SBB electric unit appeared, it being an all German line, but on the other hand it’s designated as a Basel S-Bahn service (as is Zell to Basel) which probably explains it. There’s no physical connection until just outside Lörrach so even though slightly late and on a 5 minute connection I was glad I’d risked it. Max Maulwurf has closed Lörrach to Zell for two months, so nothing for it but to go back to Basel Bad on another SBB EMU. Remarkably comfortable compared with German equivalents, just like their IC/EC stock. On arrival back at Basel Bad I found an RB about to go to Waldshut so decided to use that rather than the IRE. While I was waiting the incoming IRE arrived - a 611 like its predecessor. The RB was a pair of new 641s with the usual uncomfortable seats. On time arrival at Waldshut - interesting times lay ahead, though I didn’t know it. There seemed to be time to get a beer, it now being 1410 and no liquid of any sort since 0815! The station buff was shut so I set off to town - no shops of a beer kind to be seen. Eventually found the pretty street with all the pubs (very nice it was too) and a little stream running down the centre. It was all covered over with boards. Apart from the bit I stepped in, of course. Luckily only one leg was soaked, to mid thigh, and there was no other damage. Back to the station empty handed, to find a bothy opposite where a Black Forest brew was available for a mere €1.60 including pfand. On the station I found you have to go through a small customs hall to get to the Swiss train. Güten tag, says I, Güten tag they replied, and off I went thinking that was that. With 3 minutes to train time and 6 minutes to Koblenz(CH) it seemed a good time to down the beer. Half way across the Rhein, round comes the Swiss border grip. Obviously with 20 normals and their shopping and one half-wet (or half soaked?) crank with a rucksack and a bottle of beer, who gets the treatment? Passport removed, calls on the mobile while the apprentice stands and watches me finish the beer (well, I only had 4 minutes by then). Then passport returned, and all smiles. After 5 pulsating minutes at Koblenz I went back to Waldshut where the station bookshop sells beer at €1.35! Collected my 10c from the bothy, then left on (yet another working) 611 to Singen, arriving on time at 1557. Hurtled round to the Victoria (which is very nice seemingly) to check in and back to the station just in time for 1610 RB to Radolfzell and 1622 therefrom to Stockach. Stockach branch is pleasant enough though Stockach itself is a bit unassuming, at least around the station. One platform road and a couple of sidings. Back again at 1646 after a very quick phot. Luckily it’s a short branch as the air con doesn’t seen to work - bit of a snag with 1.5 metre square non-opening windows. 1718 to Friedrichshafen Stadt (it says on the train) or Hafen (it says on the timetable) is two Adtranz 650s (with the trapezoid windows). The air con seems to work in the rear one, so that’s where I am. Time will tell. A fairly dull trundle on the 650s with a long wait at Ludwigshafen to cross one of the errant 611s, which made us 13 late. This was cut back to 6 by Friedrichshafen Stadt, but indeed we didn’t go to Hafen, all DB trains being SEV’d for the duration according to the parish notices. Noticing a 611 with Lindau on it I nipped across to P1, to discover that it was the 1841 ‘as booked’. With a 1903 back this was an obvious move and I just had time to go into the booking hall and discover that BOB were still going to the Hafen. Over to Lindau in short order but slightly late, worrying whether it was the same kart coming back. The only train in sight on arrival was an ÖBB for Innsbruck, and sure enough mine was on the board as 1903 off P4, though shown as ICE not IRE. I dived in and at the time of writing we’re just approaching F/hafen Stadt on the return. BOB were indeed still going to the Hafen - at 1955. Very nice seats in their Adtranz kart as well. With sunset just after 2000 and a cloudless evening - what an end to the day’s gricing. F/hafen Hafen is a dreary place though, well in the tradition of ferry ports. The entire branch is platform, albeit a long one. Really, you wonder why they bother. [As at Newhaven Marine.] Still, it’s track, innit. [Ditto.] 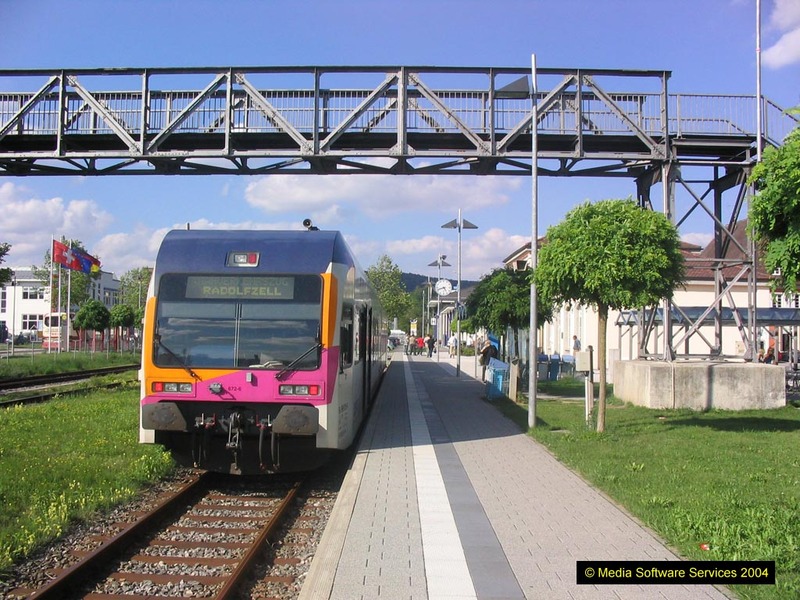 The best thing is that in going out to Lindau from P1 you cover all possible connections to the branch, so no problem at all with the physical connection. For the record, BOB went from P4 and to P5. Back to Singen on an RB in the dark, which wasn’t too exciting. On arrival at Singen is seemed that the Happening Place To Be in Singen was the station buffet, or failing that the pizza place across the road. That being the case, going to bed seemed the best bet. Breakfast at the Victoria was towards the unexceptional end of the spectrum but it did the business. Off to the station, where the third ticket machine was the only one which a) would offer me the requisite ticket and b) would accept my €20 note. This hurdle overcome, 0902 RB to Kreuzlingen then turned up late (9 minute connection at Kreuzlingen). Why didn’t I get the 0832? Stupidity I guess. I was up at 0700! Off to Kreuzlingen with lateness varying between 7 and 12 minutes, not helped by an apparent door failure en route. On arrival at Konstanz where there is a fence part way along P1, an announcement was made (in German only, not the other two Swiss languages) about passport controls. I wasn’t sure what it meant so stayed aboard on the basis that they’d throw me off if required, and duly did the track. All the lost time was regained at Konstanz and there was plenty of time at Kreuzlingen, where I’d misread the map and was well surprised when the train set off in what I thought was the wrong direction. Not the most exciting trundle to Rorschach, it must be said. The Bodensee looked nice though, on a lovely sunny morning. During the stop at Romanshorn I nipped out to take note of the platform (5) for the 1732 to Kreuzlingen, in case of requiring a hasty connection later. There was around 25 minutes to wait at Rorschach (incoming train slightly late due to delay on the single line at Horn. Shock, horror. Thought this not allowed in Switzerland). No beer in evidence at the station kiosk outside Rorschach, where I’d hoped to obtain supplies for celebrating completion of Liechtenstein track! Maybe it’s like home - will try the shops at Buchs. The RE (not RegionalExpress, but equivalent) to Buchs SG (St Gallen?) turned up on time - air con stock with Re 4/4 11152 in charge. Peace reigned until St Margarethen where Wayne and Waynetta Slob joined. 40s, fat, ugly, loud (really, really loud) and with flip-up sunglasses on their horn rimmed bottle lenses. Horrendous, even by British standards. They sat on opposite sides of the train and bellowed at each other until Buchs. When I went to leave the train at Buchs I watched in fear and trembling lest their Arts Council grant had run out and they had to leave too. They didn’t. For me, Buchs wasn’t much of a place. Impressive mountains around, but a featureless modern centre. It was rather like Poprad (see May 2004) but with different prices. £500,000 ish for a 4-bed house. £6 for McDonalds. I did however manage to obtain a can of Feldschlösschen (from Rheinfelden, CH) for a bargain basement SFR 2.90 (£1.25ish), which was duly opened upon crossing into Liechtenstein. The line through Liechtenstein (done on an Austrian 6000 class electric kart) has the character of a rural branch, particularly at Tisis. [which is actually in Austria!] Modest amounts of freight traffic were in evidence at Nendeln (timber) and at a private siding just north of Tisis. I leapt on to the platform at Forst-Hilti just so I could say I’d set foot in Liechtenstein. How sad is that? The gripper, a friendly bloke, was amazed. I just had time to finish the Feldschlösschen (surprisingly nice) before arrival at Feldkirch. Here there were strange goings-on with an ÖBB electric and 3 Swiss coaches, forming 1202 to Buchs and Sargans, pulling up at the front of P2 with my 1259 to Lindau showing behind it. There proved to be a crossover however, which was quite pleasing as we then had to use the same track out of Feldkirch that the kart had used coming in from Liechtenstein. All stations to Lindau Hbf via Bregenz - deadly dull but within 2 minutes of time all the way, so the 7 minute connection at Lindau for Rabbit 218457 on 1404 to Hergatz and Augsburg (alas, SEV between Hergatz and Kißlegg) was easy. At least there seems to be a refreshment opportunity at Hergatz, if there are any. The Greater Authority’s on form again - a rather lethargic thrash by the Rabbit got us there somewhat late, but still with time to potter across the road for a Schussenwieder at a pleasant enough pub which looks as if it’s closed during the day from next Wednesday! Although the ride was lethargic it’s a pleasant one through countryside where apples are a major crop. The soil must suit the little chaps - the vines I’d expected aren’t very numerous but there are many large orchards. I’d arrived back in Germany at Lindau of course, this time without seeing a border person except at a distance. All a bit farcical, albeit Germany and Austria are both Schengen. There was no check between Switzerland, Liechtenstein and the EU. I was slightly concerned that the bus driver was at the pub - but nothing untoward and we made the connection at Kißlegg. 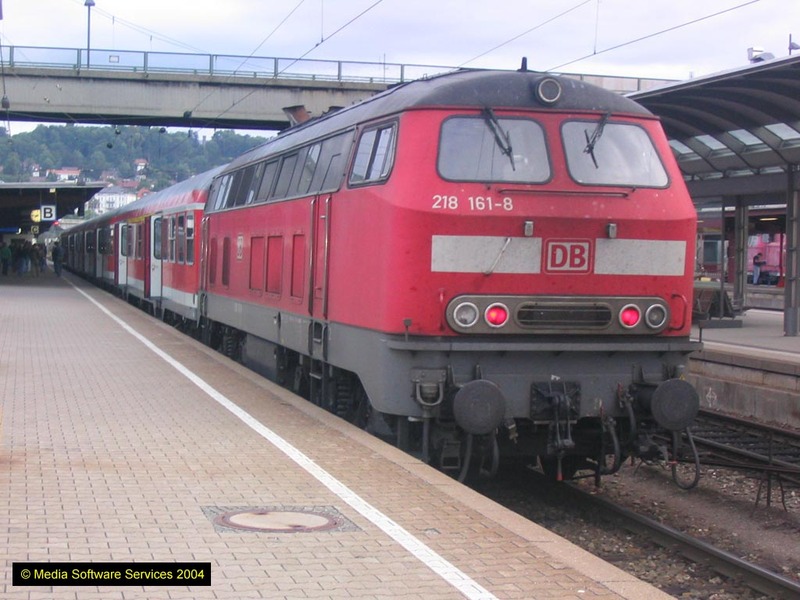 This ran sloppily and should have missed the connection at Aulendorf - but that was 218496 with a double deck set and was 9 late, so there was even time to pick up a Stuttgarter Hofbräu. 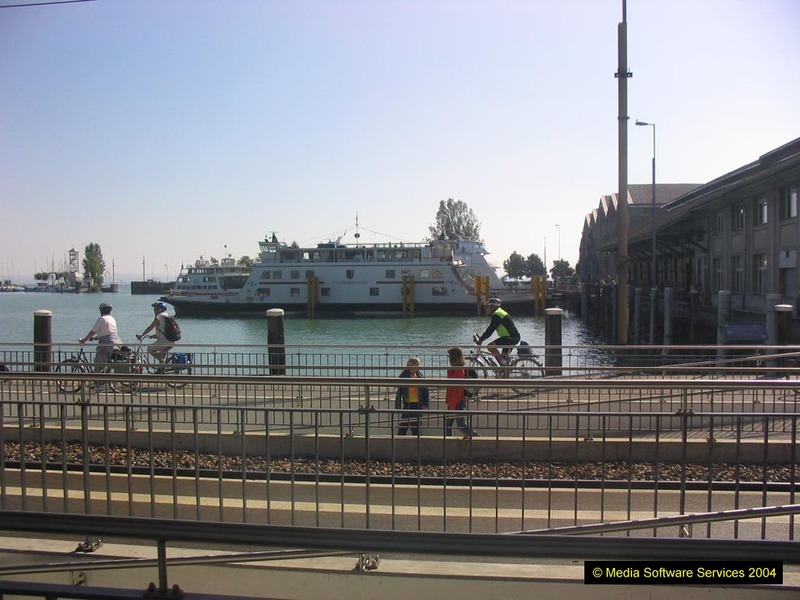 Now, I guess we’ll either miss the boat at Friedrichshafen or the train at Romanshorn, but who knows. Who indeed. On arrival at Friedrichshafen, a mad dash to the bus (giving thanks to Greater Authority for giving me the idea of doing the Hafen yesterday), which had no driver. He soon arrived however, and tore off to the Hafen on a ‘Devil take the hindmost’ basis. If you were then prepared to go for a brisk trot round the terminal you could throw yourself on to the ferry as they cast off. I was, and I did. If you’re halt, lame, have heavy luggage or can’t think on your feet then you have no place at Friedrichshafen it would seem. Anyway, back to the boat - rather reminiscent of the old Pompey-Fishbourne with a through deck for the infernal combustion machines and precious little else. Except a bar of course, which dispensed Schützengarten St Gallen Landbier in a handsome swingtop bottle, for an even more handsome (no, outrageous is the word I meant) €3.70. Well, you have to, don’t you. I hope the brewery won't mind. 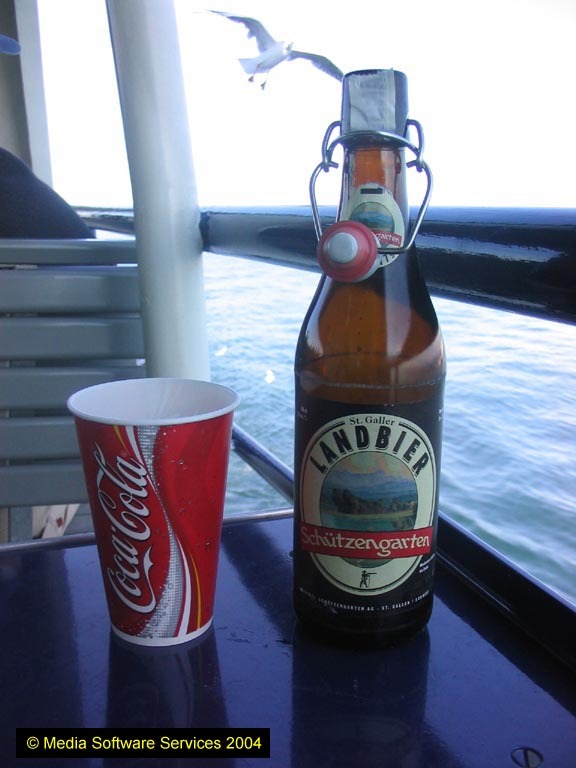 This was found most efficacious in passing the time as we pottered across Bodensee! As pleasant a 40 minutes as I’ve spent on a ferry, all in all. Arrival at Romanshorn was a few minutes late but after great amusement by all at Herr Schweiz-Poser who couldn’t get his Harley to start, and the inevitable Grenzpolizei queue (not too interested this time though did at least clock my UK passport and stop me to look at it properly) I made the 1732 with a couple of minutes to spare. This morning’s homework proved invaluable! In the event it was late leaving, and remained so to Kreuzlingen. A pity as it turned out, as the connection to Konstanz was booked out of P2, doing the physical connection. But I’m not doing Swiss track. Yet. On to Konstanz where the prospect of a 1900 arrival at Singen didn’t seem too inviting. I decided to bale out and visit the Konstanz brew pub (Brauhaus Johannes Albrecht, one of a chain - Hamburg, Soltau, Bielefeld, Düsseldorf, Regensburg too. I suspect there’s one in Berlin as well, or maybe that’s Alzheimer talking. [Yep, it’s Alzheimer. There isn’t a BJA in Berlin yet.] Anyway, there’s a very severe shortage of streetmaps in Konstanz. Surely to goodness the TIC should have one in its window. Not to mention the station. Luckily vague memory of something I’d seen on the ‘Net sent me in the right direction, approximately, and I found a street map before I was too far away. BJA provided the murkiest weizenbier I’ve ever seen, by far. Didn’t taste bad, though, nor good either. Tomorrow will reveal all, hopefully in a controlled manner. Back to the station via McDonalds (3 quid in Konstanz vs 6 in Buchs SG) and then on to an RB with only one stop, to Singen. A life on the ocean wave. In this case Bodensee/Lake Constance. 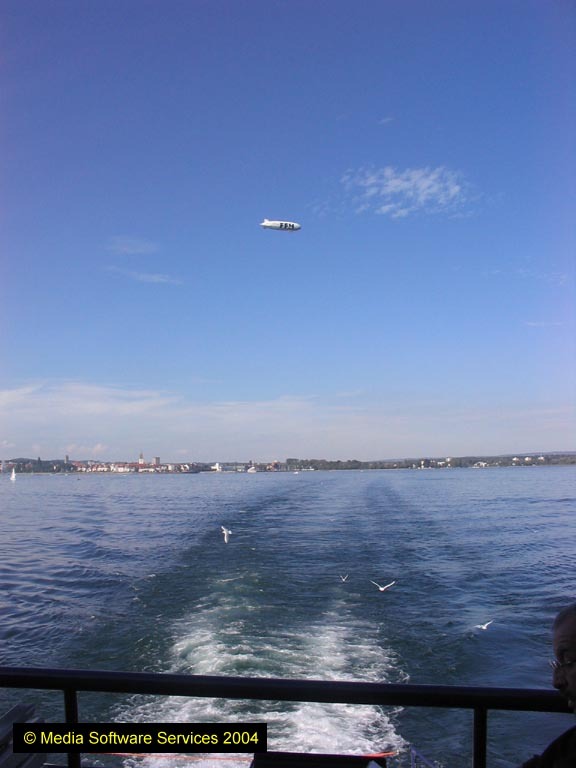 The airship is not a fake, it flies out of Freidrichshafen airport, one time Zeppelin base. 0100, water through ceiling. [A novel form of Happy Birthday!] Staff were just shutting up shop fortunately so I was able to move to the next room. No damage done to me or my belongings, but I’m less sure about the room! Didn’t do much for an already fractured night’s sleep and the alarm at 0430 wasn’t welcome. Singen station was surprisingly well populated with young ex-revellers (presumably), dossers, etc. Kebab stall next to the hotel was also functioning for early breakfast. 0506 to Friedrichshafen was three 650s, almost empty leaving Singen but almost full from Radolfzell. A bit of a drag doing this in the dark for a second time - but joy unconfined on arrival at Friedrichshafen. I’d failed to note in the K-buch the difference between ‘Mo-Fr’ with a bicycle symbol, and ‘Mo-Fr =’ with a bicycle symbol. The 0630 IRE to Ulm in fact runs daily and the ‘Mo-Fr’ relates only to the carriage, or otherwise, of bicycles. I’d thought I was doomed to the 0705 BOB unit all stations to Aulendorf and then an RB ditto to Ulm, arriving at 0840. This was only 5 minutes before the IRE I’d originally planned but eliminated the risk of Rabbitution with consequent late running. In the event, 218161 turned up on time with the 0630. [Presumably it’s a kart during the week, hence the bicycle business.] The kiddies from Radolfzell all piled into the rear two coaches, leaving the leading ones for the older generation! I wonder if these are all booked for Rabbits and I needn’t have worried. Better safe than sorry I guess - but I bet the other one rolls in dead on time at 0845. 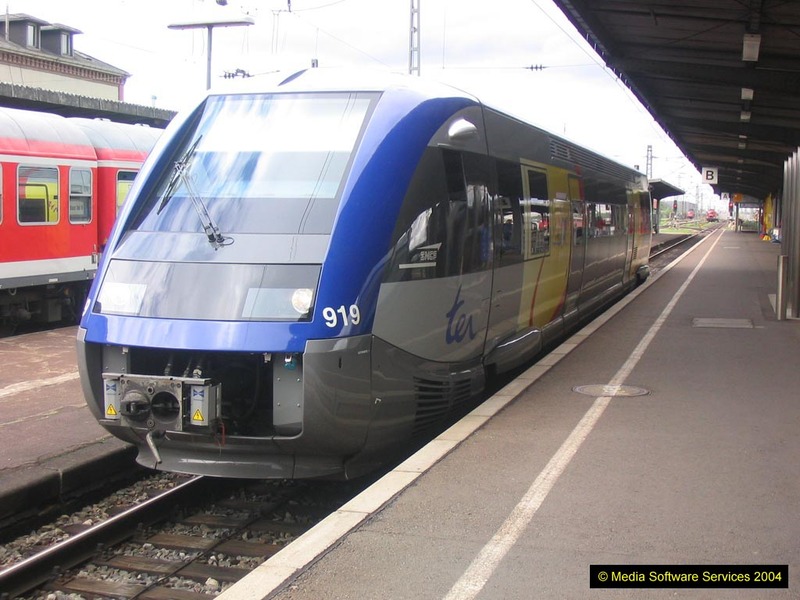 218161 tore up to Ulm in fine style, as well it might with 2000 hp for four single deck coaches. Arrival at Ulm was on time at 0745, allowing me time for coffee and a mayo free roll, as well as a walk up to the cathedral [tallest spire in Europe, as quiz bores know] and back after buying my EC ticket for Strasbourg - Baden-Baden tomorrow. I arrived back from the cathedral at 08:44.45 just in time to see the IRE from Friedrichshafen rolling into P3. Well, at least I didn’t have to worry about the timekeeping. The train to Kleinengstingen (‘Ulmer Spatz’) turned out to be two Ferkeltaxis sandwiching two trailers and seemingly worked/owned? by Schienenbusfreunde Ulm. It’s hard to imagine such things have friends, but what do I know. Timekeeping is poor (partly caused by a late running DB train on the main line) and at the time of writing, 12 late from Münsingen, I’m concerned about the connection. Presumably it will wait - not much point in running, else! 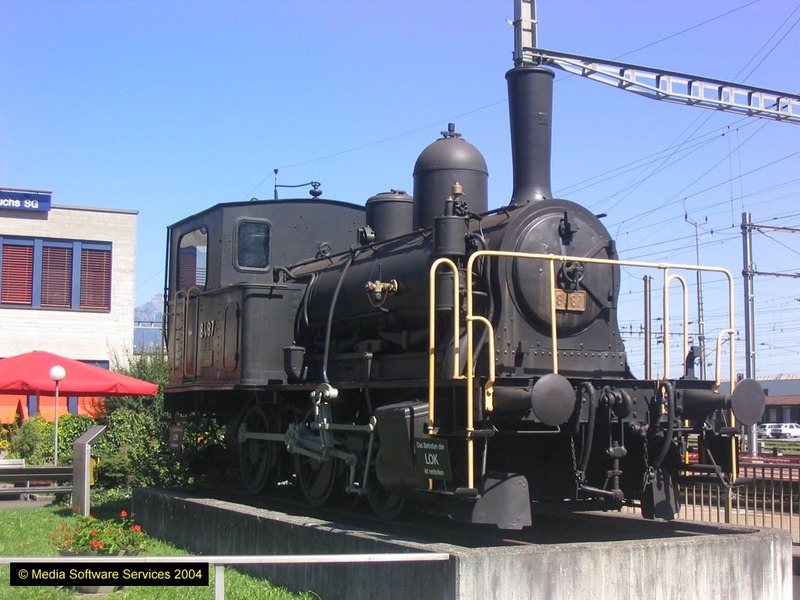 There appears to be a preservation operation at Münsingen, complete with stuffed 0-6-0T. Settled down on the HzL kart then checked the timetable book. Panic set in yet again as all the HzL ‘trains’ on a Sunday seemed to be buses. Reason then prevailed and it occurred to me that my timetable was issued in December 2003 and my CD updated in August 2004. Maybe the CD was right? Checked at Sigmaringen. It was. Half an hour until train time, bar open, only one thing for it. A dreadful dingy place but the pleasant barmaid and waitress were working their socks off, and it sold beer (Zollerhof Export). So there you go - or I went. Back up to Gammertingen on the 1305 which materialised as booked, and then the ‘main’ HzL route to Hechingen (using the north curve, and noting very shiny track on the freight line to Eyach). The timetable was such that there wasn’t much point in doing anything other than continuing to Tübingen. A quick check there revealed that Horb and back, or Metzingen and back, weren’t doable in an hour so it was off to the Gasthausbrauerei Neckarmüller whose very pleasant riverside setting presumably justifies the fairly stiff price (€2.70/0.5l) for the Weisse. Then again, would you get a quality beer in an Oxford riverside pub for £2.15/pint? I think not. Nice too, with a table in the shade. With the sun out it’s a pleasant place to while away half an hour. Meanwhile, back to the trains. Bit of a surprise at Hechingen on the way back - there seems to be a full scale flying junction, sufficiently widely separated to be track in my book. Presumably you join the freight line from Eyach though as it caught me unawares I’ll have to look at a map to be sure. A chance purchase at the shop on Tübingen station was Carl Dinckelacker’s Volkfestbier brewed in honour of the Cannstadt Volksfest in Sept/Oct, whatever that may be. [H and I found out a year later!] It’s 5.5% anyway. And well in advance of CD’s CD Pils. Amazingly, given the night time flood, the early start and the beer, I stayed awake for the entire sentence Tübingen - Sigmaringen - Aulendorf - Erbach. Not quite as booked at Sigmaringen - HzL terminated in P6 and we were required to transfer to a DB 650 in P5 for the remainder. Dull it all was too. Aulendorf - Herbertingen - Erbach is well maintained, flat and boring. Despite having done it already I carried on past Laupheim West to Erbach just to reduce the waiting time. I’d spotted a bus at Laupheim West on the way through, and on the way back to Laupheim Stadt the driver baled out at Laupheim West. Strange manoeuvre but it proved only to be a crew change and we were soon away down a short and mostly straight branch to the single platform, plain track and bus shelter terminus at Laupheim Stadt. Oddly, the 650 for this trip had comfortable seats down one side of the ‘well’, tip-up sideways seats on the other side and no toilet. You pays your money and gets somebody else’s choice, it would seem. Back to Ulm - no option but McDonalds here for a pizza hater with 25 minutes. I didn’t dare leave it until 2130 on Sunday in Aalen! The 2000 IRE to Aalen went from P5A, the same north end bay that the Ferkeltaxis went from this morning. You can’t have your overlap better than that. When it eventually materialised it was a single Adtranz 650 in another new variety - comfortable seats and a toilet. Good thing too, it would seem - I was sitting near to said facility and it was very busy. The directions to the hotel from the DB website were, for the first time, infuriatingly inaccurate. It required a complete circuit of almost a mile before I got to the starting point. Thereafter there weren’t any street names but that was less of a problem once heading in the right direction. I wasn’t angry when I got there after half an hour, honest, not even when the door was locked. Good job it was only 2130. Had Ulm looked a little more inviting I might have stopped there for a proper meal. No real harm done, however, as it’s a late start tomorrow, so I stepped out for a beer. Nice in Aalen but not (as I suspected, hence the McDonalds) at 2200 on a Sunday. I did find a place with reasonable numbers sitting outside though, and settled for an Erdinger. A good night’s sleep, with ceiling intact this time. Rain was threatening as I had breakfast and paid the bill, and duly started as I left the hotel. The journey was much easier in daylight and knowing the tricks. IRE 22519 (0907 to Ulm) was 2 x 650 again, this time with toilet and ‘torture chamber’ seats. Into Ulm on time, more or less, leaving time to get a bottle of pop for the 2 hours + 1 hour journey to Offenburg. The train is a (far too hot) 611 so hopefully can keep time. It remains to be seen if there are any of the threatened bustitutions between Sigmaringen and Tuttlingen. Doesn’t matter if there are, from a track point of view, but the delay would be a problem. Signal problem en route Immendingen just to add to the fun, but away from Immendingen by 1231 in the end, hopefully well in front of the Offenburg train. No loop at Geisingen so I guess the electric will have to wait. I’ll probably find it’s late! It was, though not by much. By the time the assembled throng had made it to P1 it was just in sight, and it ambled in 8 late at 1248. The short ‘dead track’ section between Donaueschingen and Villingen just afforded time to nip along the corridor! Amid all the excitement I noted that the stretch of the Donau/Danube valley west of Sigmaringen is also pretty exciting, with some remarkable rock formations and a narrow valley, nay even gorge. The cloud and rain descended of course, as soon as we left Donaueschingen. Consequently apart from rain, damp, lots of gloom and 23 tunnels there’s not much to report on the Schwarzwaldbahn apart from track done through to Hausach (it was dark last time). Offenburg was its usual horrible self but at least some rebuilding seems to be taking place. Knocking the station down and starting again would be the kindest thing. A French SULFA of the 73xxx series was waiting to be the 1438 to Strasbourg and in French style it had scuttled up the platform to hide so that nobody could wait in comfort. It eventually came back then was delayed 12 minutes waiting connections, which was entirely a German problem! In fairness to it, it had nice seats, rode well and the air con worked. You can see out of the windows too, so it wasn’t bad as these things go. Onwards then, to Appenweier, Kehl and across the Rhein to Strasbourg. Naïvely, I thought Strasbourg was on the river (it isn’t) and was surprised how far my couple of Euros took me! At Strasbourg, more hotels than you could shake a stick at. Shame I’m staying in Pforzheim. I followed previously obtained directions to La Brasserie de la Lanterne, arriving at 1540 to find it shut, but mercifully opening at 1600. Spent the time sussing the tram system to save the walk back. Returned at 1558 to find the door open, went in, was requested to leave! Went and bought a ticket for ‘Ron, returned at 1603 and was made welcome. There was a wonderful smell of brewing which must have been done today. I tried the Fender blonde which was unfiltered, very expensive (€4.20/0.5 l, or £3.30/pint) and OK-ish. The ambree is called Stratocaster and there are various other intermittent brews. Back to the station on the tram (routes A and D, €1.20) to find dark blue 181201 waiting with EC267. Kehl has a number of bright blue sheep (concrete) in a garden by the Rhein. Eat your heart out, Milton Keynes! The Appenweier north curve was gratifying but unexceptional other than that it remains separate for quite a way, eventually joining the Rhein Valley line at km 136.6. For some reason we crossed right over and ran on the ‘slow’ lines (very quickly) to Baden-Baden. Tempted to have a beer at the station hotel at B-B, I thought better of it and awaited the S4 to Karlsruhe Durlacher Tor. Nothing new here but I remain very impressed with the way Karlsruhe does things. Off down Kapellenstr. to Vogelbräu at no. 50. The standard unfiltered pils here was absolutely excellent, definitely one of the best. They also had a terrifying weizen doppelbock at 7.7%, but this seemed a good thing to avoid, particularly as I haven’t eaten yet. Back to Durlacher Tor then for the late running S5 to Pforzheim and the hotel. I have this warm feeling that the road-rail connection at Durlach was new track, but I’ll have to check. 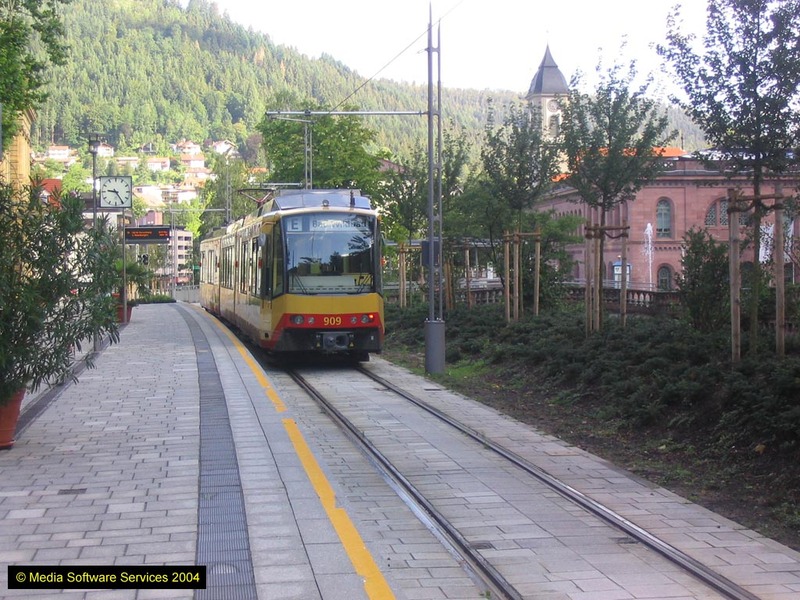 There’s quite a lot of separate alignment for the trams too, so it was worthwhile using the S5 rather than changing to an RE at Durlach which was the original plan. Hotel Montana was 10 minutes walk from the station - though the map was pretty good this time I couldn’t see the hotel at first and was thrown by no. 6 being half way along the street. Luckily I chose to turn the right (actually left) way. Brauhaus Pforzheim was only another 5 minutes, if that - pleasant pub but regrettably nearly empty through no discernible fault of its own. Another very classy unfiltered pils; they don’t make the hefeweizen themselves unfortunately. After the Kinks and the Mamas and Papas, inter alia, at Karlsruhe, it was the Eagles at Pforzheim. Not to mention Europe (The Final Countdown) and the Weather Girls (It’s Raining Men). Away to Mühlacker then for the only failure of the day, with Michelbräu looking very defunct/moved/whatever. By the time I found the location I’d missed the 2201 back to Pforzheim so had to wait it out in the station gaststätte (Alpirsbacher). I forgot my paper, too. The return train was on time fortunately, so I was back in the hotel only to be awakened at 0130 by a violent dispute with the onions from my meal at the Pforzheim brew pub. I should have known better. Last day started with a careful breakfast at the Hotel Montana (see 30.8.04!). On to the tram at 0847 to go to Bad Wildbad, a fine valley branch following the River Enz. Bad Wildbad Kurpark, terminus of the extended Enzbahn 31-8-04. The photograph is taken looking north towards Pforzheim. The old station at Bad Wildbad is at the northern (downstream) end of the town, which stretches up the valley for 1 or 2 km. 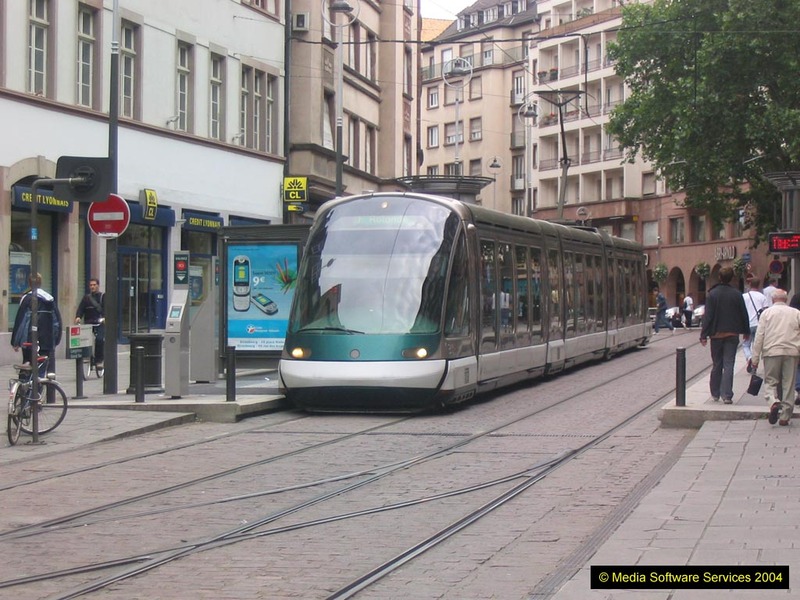 The rationale for the extension to Kurpark is obvious when you see it - the tram simply runs the length of the main street, which is pedestrianised. It all seems to work very well with the single OHLE not appearing particularly intrusive. Thoroughly admirable, well used, and the sort of thing which couldn’t happen in the UK in a million years. Back to Pforzheim (I walked the 200m or so down to Uhlandstrasse for want of anything better to do) on the same tram, changing there to an S5 tram to Bietigheim-Bissingen. The dreaded travel survey man was on the tram - surveyed everybody behind me, the person behind me, the one in front of me, but not me! I haven’t heard ‘Country Roads’ yet, either. At Bietigheim-Bissingen I’d wondered about visiting the Michel brew pub (is this the same one that isn’t at Mühlacker, I wonder?). Its name was still on the display box at the station but the display had disappeared so I guess it’s defunct. [In 2006 all the usual sources suggest that it is indeed defunct] The address proved to be far too far away for the time available, anyway. Plenty of other places for a beer but as it was 1055 I decided against, and caught the 1105 double deck RB to Heilbronn with a view to picking up the RE to Lauda there. Which I did, having also picked up a Stuttgarter Hofbräu. A very pleasant run out to Lauda ensued. It was still sunny but not too hot, there was a gap to be filled and the train was on time, near enough. You can’t say fairer than that. The gripper and the trolley man were both notably miserable, but that’s their problem. No beer shop (though a couple of pubs) at Lauda so the S-Hofbräu was a good purchase! Back from Lauda on dead track, punctuality reasonably adequate (15 seconds late at Stuttgart Hbf after a signal check on the approach!). After an eventually successful (in that I found it) but unsuccessful (in that it was shut) attempt to locate Sophie’s Brauhaus - sort of between Stadtmitte and Feuersee but not so as you’d notice - it was away to the airport. Presented myself at the gate (not check-in) at 1720 for a 1755 flight, which seemed entirely reasonable. Got on the bus at 1745ish… Whether this was routine or paranoia I don’t know. I was a long way from being the last on the bus. T/o eventually was about 1830 and Cap’n Andy is reporting a headwind, de dah, de dah, so who knows. Food unspeakably revolting - why put mozzarella and lettuce in a sandwich for heavens sake (neither of them tastes of anything) but the G&T was OK albeit Tanqueray’s. They are Tanqueray Gordon after all. Harrumph!! American or Canadian cabin crew as well. Harrumph, harrumph. At least we got a cup of coffee this time. [Wasted effort harrumphing. BHX-STR is now (2006) a BA Connect route and you don’t get anything except transport. If you want a G&T you have to pay for it. They claim they’ve lowered the fares - noticeable though that they’ve just reported increased profits…2018, it's Flybe now but still basic] Home via CT, Codsall station (too late for food but not Special) and car. Bad Wildbad Kurpark, terminus of the extended Enzbahn 31.8.04. The photograph is taken looking north towards Pforzheim.